Hello Friends!! I hope you all had a wonderful Father's Day weekend! I have to say this weekend was a slow paced one for us, which is nice since we've spent our last few On-The-Go! 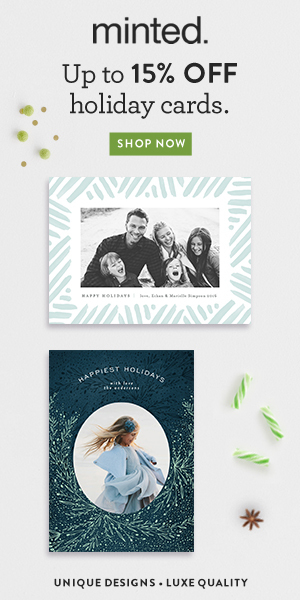 With us just hanging around the house, a fun little product from the wonderful online shop Wall Decal Tree came in the mail just in time for our family fun at home. Before I get into our exciting new playtime gem, I want to tell you a little bit about the shop from which it came, called Wall Decal Tree. This charming online store offers a massive assortment of home decor decals that will liven up any space in your home or office. 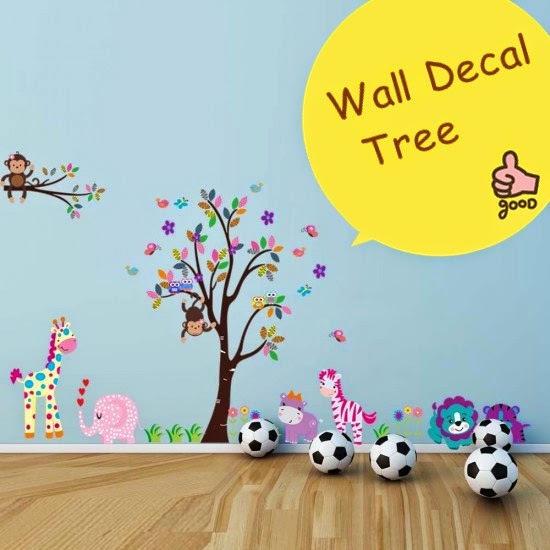 They are known for their fanciful Tree as well as Nursery & Kids Wall Stickers. You will also find an array of modern graphic wall art that will meet anyone's style or taste. For those customers that like the word "custom", Wall decal Tree has a "create your own quote or text"option allowing for custom decor solutions that can easily be changed out or removed later. Here is a little sample of what you will find! Since my little McKenzie's Nursery is pretty much complete, I am know focusing my attention on her "temporary" playroom. 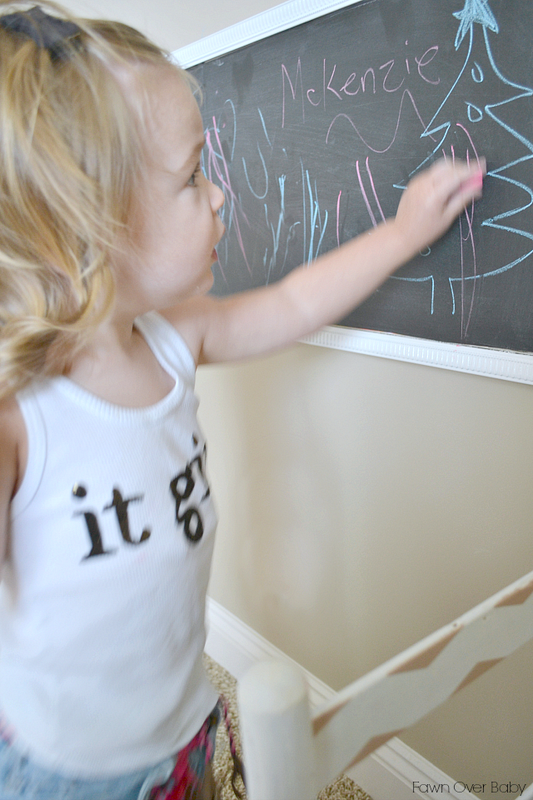 These days Kenzie is obsessed with chalk and drawing on anything in her path (i've had to invest in A LOT of magic erasers), so when Wall Decal Tree kindly allowed me to choose our decal of choice, it was a no brainer - Chalkboard Wall Sticker! 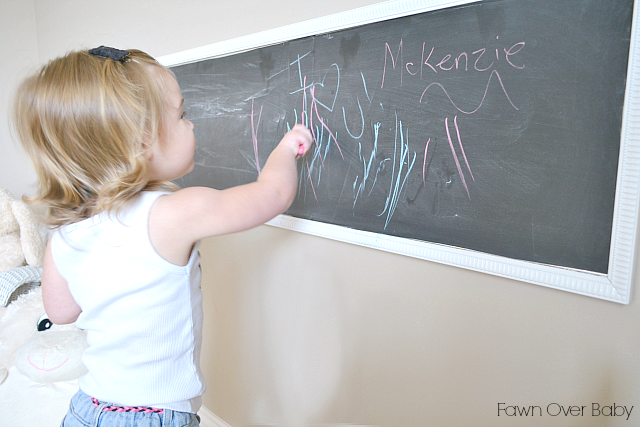 My thinking is that maybe this will give McKenzie an actual chalkboard to practice her beautiful chalk art on, instead of everywhere else in our house. 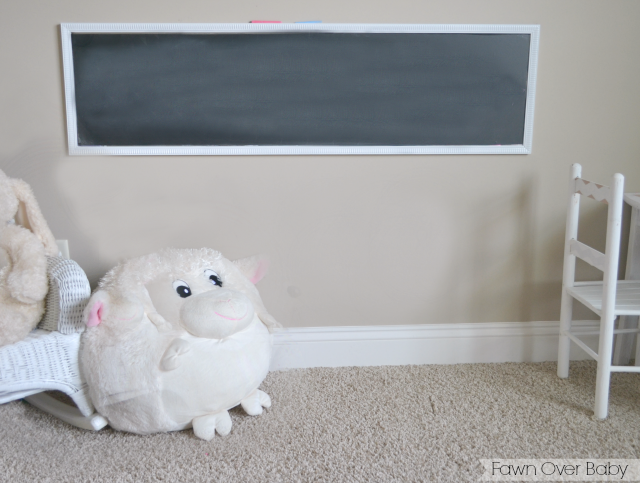 If you are big chalkboard fan like me, you will love these adorable Chalkboard Silhouettes that Wall Decal Tree offers as well! When we received our decal, it came neatly rolled up with a little packet of chalk in several colors. Chalk was such a nice surprise as our collection consists of broken little pieces or worn down pieces from so much use. My first order of business was deciding which wall to display this lovely blackboard on. At first I planned on adhering it to her playroom closet door, however I had to come up with a different location as our doors have trim inlays which wouldn't provide the smooth surface these decals require. My second idea was to frame it out and hang it up on the wall. After struggling to find a frame the size and length that I wanted and not really wanting to assemble my own, I came up with the idea to just purchase a full length mirror and apply the chalkboard decal to the mirror giving it the framed look that I wanted! 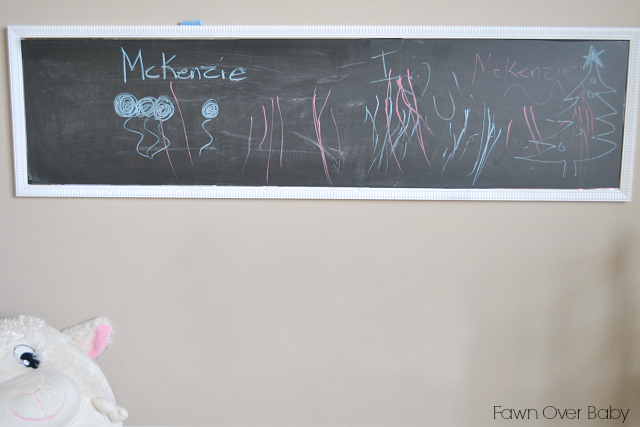 So after a quick trip to Walmart to pick up my mirror (only $11), a peel and stick party during nap time, and a little bit of conditioning to prepare it for chalk (just rub side of chalk all over board, then wipe clean), Kenzie's new framed out chalboard was ready for scribbles! 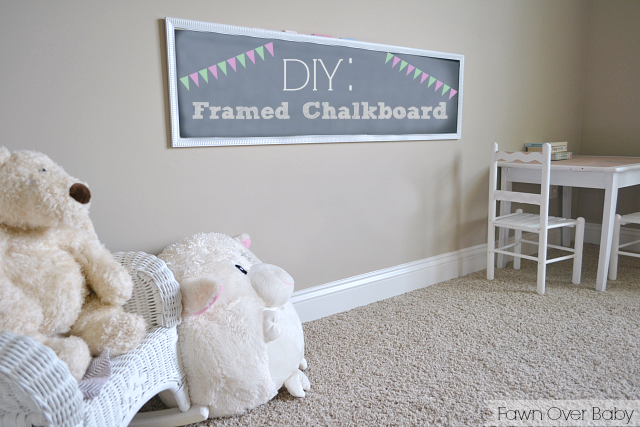 I am so happy with how it turned out and I have to say the Chalkboard Wall Decal was so easy to apply and you wouldn't even know that it is a peel and stick as the quality is superb! After conditioning or "slating" the chalkboard I couldn't help by write a little love message to greet her when she walked in :) As you can see she went straight for the chalk that I had resting on top. 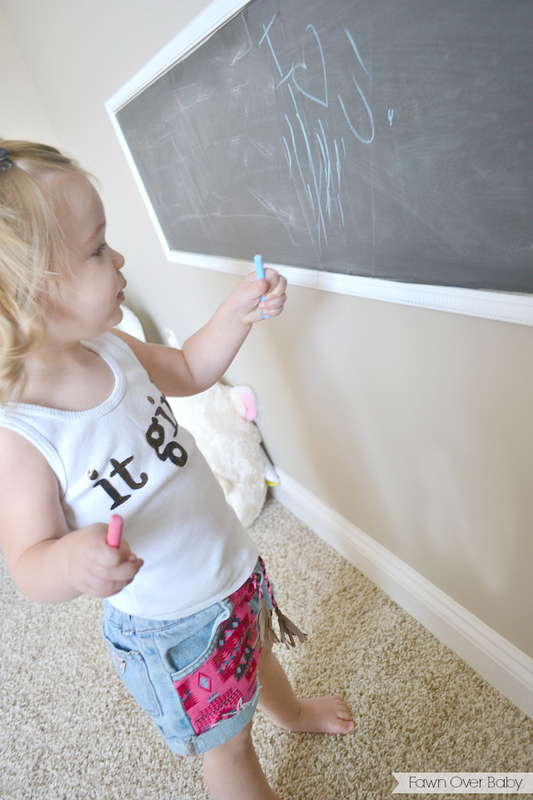 McKenzie absolutely loves her new chalkboard. 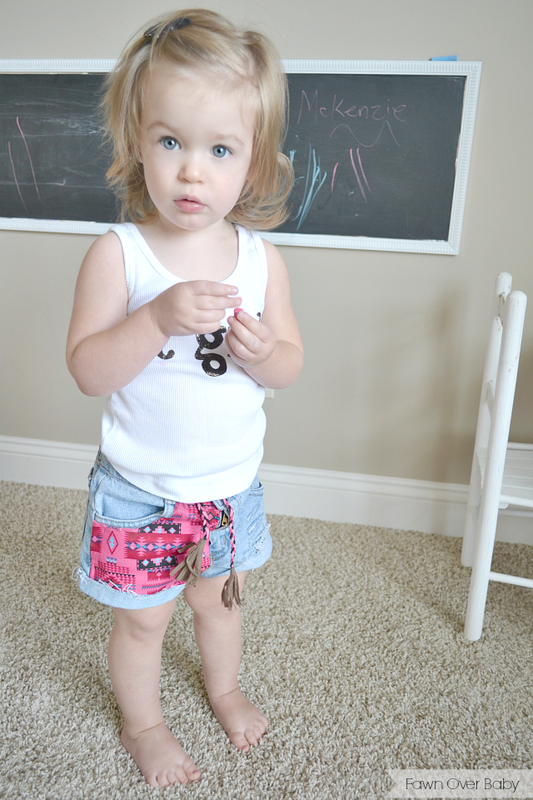 She kept saying "chalk!" "chalk!" "chalk!" 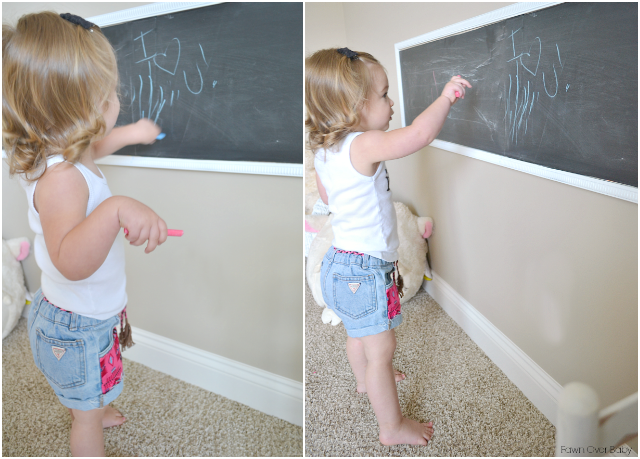 Broken chalk did not stop my little artist though, she continued on until her chalkboard masterpiece was complete! 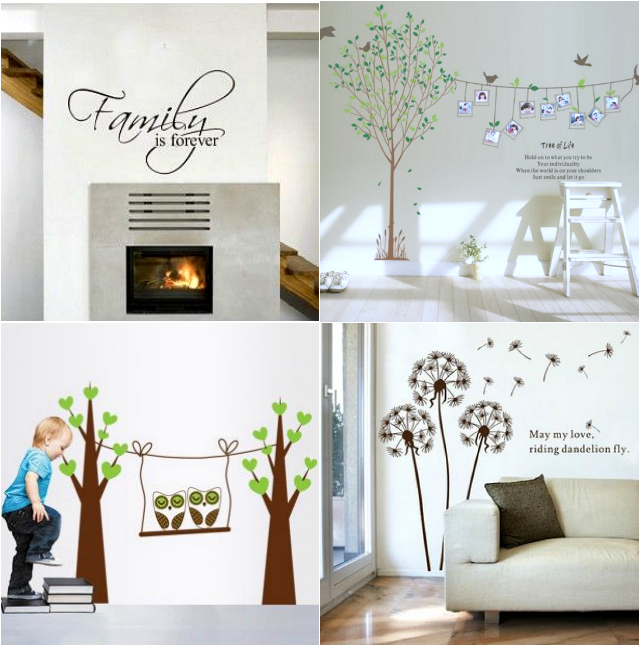 We absolutely love our Wall Decal Tree decal and I know you will too! If your wall space is in need of a little TLC, these wall stickers are a "fun, easy and removable decor solution"! 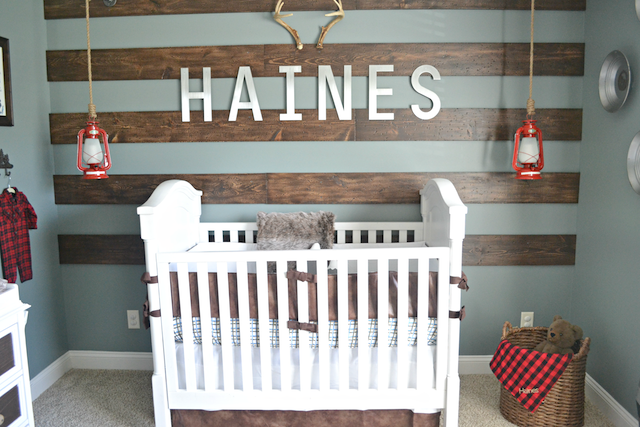 To help get you started and to Welcome You to their fantastic online shop, Wall Decal Tree is offering all Fawn Over Baby Readers 15% OFF your total purchase!! Just use code "15OFF" at checkout to receive your generous discount! Eeeeeeep how fun does this look?! Love that it's on a mirror! So creative, you are.